NJ DOE Watch: DOE Commissioner Repollet Cancelled All School Audits and The Feds Don’t Like It. Will Gov. Murphy Take Action? You have to give him this: Education Commissioner Lamont Repollet didn’t waste any time. Governor Phil Murphy appointed him on January 29, 2018. Ten days Repollet had his assistant send an email to the Assistant Director of Student Services and the Director of the Office of Fiscal Accountability & Compliance, cc’d to two Assistant Commissioners and a secretary in the Fiscal Accountability office. Acting Commissioner Repollet has asked that all consolidated reports starting today be put on a freeze/hold until he has had a chance to meet with you and your staff. If have already completed the report, that is fine. If you are in the middle of the report/have a meeting scheduled with district, please let the district know the meeting will be rescheduled. Please let me know by return email you have received this message. Thank you for your cooperation. So, what’s up at the DOE and what does this mean? This is what I’ve been told (and had verified by additional sources). 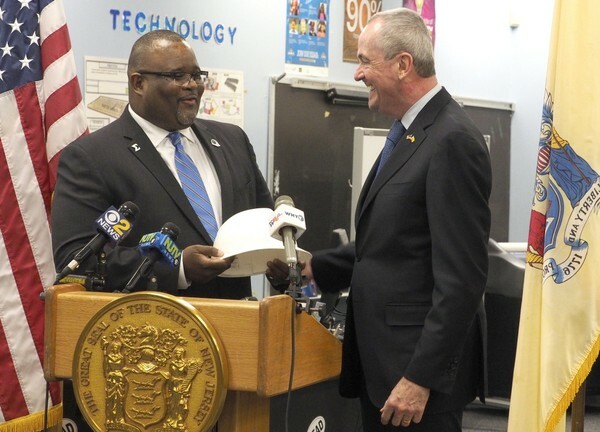 Back when Repollet was Superintendent of Asbury Park School District, where he served from 2014-2018, the district had its annual audit — or “consolidated report” — performed by the NJ DOE, to ascertain compliance with the dispersal of federal funding streams like Title 1 money (for low-income students), Title 3 money (for literacy instruction), Perkins grants (for vocational and technical instruction), etc. Asbury Park didn’t do so well. According to the 17-page report, NJ DOE officers found 32 “findings,” or ways in which Asbury Park School District misallocated federal funds and/or didn’t comply with regulations. (If someone wants the whole document, shoot me an email.) Here are a few examples. Finding 2: Bradley and Thurgood Marshall Elementary Schools did not complete schoolwide plans for the 2013-2014 school year. Schools running Title I schoolwide programs must annually complete a comprehensive plan (schoolwide plan) that addresses the required legislative components. To this end, the use of Title I funds for activities not included in the schoolwide plan are not allowable, and are therefore subject to recovery…If the submitted plans do not meet the legislative requirements, the NJDOE will rescind the school’s authority to operate a schoolwide program. Finding 17: The district is not offering a coherent sequence of courses for any of its CTE [Career Technical Education] programs that are being supported with Perkins funds. It appears that the district is offering a variety of electives without regard to sequencing for program completion. Citation: N.J.A.C. 6A:19-3.1.6(i): Program requirements. Required Action: The district must ensure that a coherent sequence of courses is offered for approved CTE programs supported with Perkins funding. The course sequence should consist of those courses identified in the approved program reapproval application. Programs and course sequence information should be available for students, teachers, guidance counselors, administrators and parents. Finding 20: The district improperly charged expenditures incurred to support the district’s fashion program of study, an unapproved CTE program, totaling $15,481.42 and $31,006.59 to the FY 2012-2013 and FY 2013-2014 Perkins grant, respectively. The use of Perkins funds for an unapproved program is not allowable. Factors affecting allowability of costs; Perkins Guidelines § D: Non-allowable costs. Required Action: The district must remit all charges associated with the district’s fashion design program of study during FY 2012-2013 and FY 2013-2014 to the NJDOE. Additionally, the district must implement procedures to ensure that only expenditures related to programs approved by the NJDOE are charged to the Perkins grant. Finding 26: During FY2012-2013, the district hired Maybelline Hicks from Regal Lady LLC [an etiquette and image consulting business] to provide “curriculum support” using Perkins funds without adhering to New Jersey Public School Contracts Law (PSCL) and federal regulations. Five payments totaling $11,101.44 were disbursed to Ms. Hicks for services rendered from February 11, 2013 through May 31, 2013 and the reimbursement of expenses. Documentation was not provided evidencing the execution of a contract between the district and the provider or the method of procurement used. Accordingly, the exact nature of the services to be provided, as well as the rate and projected cost for these services were undeterminable. Sound business practice and PSCL require that contracts be issued in a deliberative and efficient manner such as through requests for proposals or other comparable means and that all contracts for the provision or performance of goods or services are in writing. Required Action: The district must submit all disallowed amounts not previously remitted under a separate finding to the NJDOE. Going forward, the district must comply with current federal and state procurement regulations and obtain multiple quotes as required. Repollet, according to sources was angry. And so when he assumed his post as Commissioner, he, per the email above, cancelled the required audits. Condition: During the audit, we noted that the Department of Education (DOE or the Department) did not perform site visits or document review of subreciepient’s financial documentation and performance reports as required by Uniform Guidance. DOE received financial and performance reports from its subrecipients throughout the year; however, documentation to support the review and determined results was not maintained. Furthermore, any follow-up action(s) related to the subrecipient’s non-compliance was not documented. Documentation to support compliance with subrecipient monitoring was not maintained for 25 out of 25 subreceipient’s selected for testing. DOE was in the process of reviewing and revising its subrecipient monitoring process. As part of the revision process all current monitoring visits and related documentation were suspended. DOE is not compliant with Uniform Guidance and is unable to support the subreciepient’s compliance with program requirements or allowability of subrecipient’s expenditures. DOE should document its subreciepient monitoring efforts as well as all follow-up action(s) due to noncompliance. DOE should consult with the grantor liaison for acceptable alternative processes and procedures for documenting subrecipient monitoring activities. But the is the first I’ve heard about brazen defiance of federal and state oversight guidelines. I’m not sure where this goes, but it can’t be anywhere good. And the primary victims, besides beleaguered DOE staffers, are New Jersey students, especially those at long-struggling districts like Asbury Park where last year only 15 percent of student met expectations in reading and 5.5 percent met expectations in math (at a total per pupil cost of in 2017, according to the DOE’s most recent “Taxpayer’s Guide to Educational Spending,” of $36,957). Governor Murphy has been much in the news for his failure to exercise appropriate oversight and offer clarity to the public in the case of Albert J. Alvarez, who was hired by the Murphy Administration for a $170,000-a year job with the New Jersey Schools Development Authority after he allegedly raped Katie Brennan. I assume Murphy has learned that transparency works better than subterfuge. If he’s taken that lesson to heart he’ll address this case of his chief education officer apparently refusing to follow regulations with possible consequences of NJ having to return federal money. I can’t be the only one wondering if Murphy will step up. Once again, my deepest gratitude to those who help me shed light on what goes on behind closed doors.